Sheffield Wednesday vs Aston Villa at Hillsborough, these days, an average Championship fixture. Two big clubs – granted, and two clubs who are right in the middle of a chase for the play-offs. There were three valuable points for both teams up for grabs, which made it more interesting, sure, but every point at this critical time in the season is vital, especially when you’re teetering on the edge of the play-off places and toying with the idea of earning promotion via Wembley. But instead of the promotion race being the most interesting and talked about aspect of the pre-match build up, it was clouded instead by a different narrative. One that Villa fans are by now, beyond sick of hearing about. Ex-Manager treated horribly by the fans of his ex-club and hounded out unfairly by the angry mob through the vicious act of cabbage hauling only because of a few poor results even after two positive seasons, where he’d steadied the ship and got them to a play-off final. That’s the media narrative anyhow. Though I always felt Bruce was hard done to towards the end of his tenure, and felt some of the abuse he received at the time and beyond was unfair, the way Villa have been painted as a whole because of the dramatics of his exit is equally as unwarranted. He was a manager who did great things for the club, for which he should be appreciated, but he was also a manager who made poor decisions that cost us at the start of this season and one who struggled to get the results this team are capable of. It was time for him to move on, simple as that. We thought all of this was behind us, though it was inevitable that some of the story would be re-hashed as Villa geared up to come face to face with Bruce in the opposition dugout for the first time, at a pivotal point in the season. 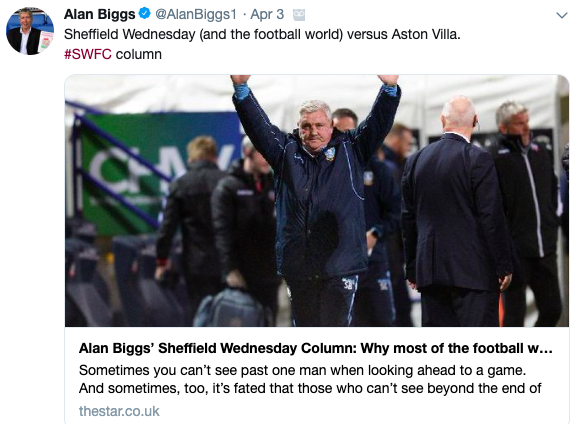 But something that appeared on social media mid-week via a Sheffield Wednesday column, was a totally blown out of proportion, biased and ill-informed article that painted Aston Villa Football Club as the villainous, wicked mortal enemy of the entire “Football World”. Apparently, along with Sheffield Wednesday, any and everyone else invested in football was looking at this fixture with the hope of a Wednesday victory, seen as poetic justice for the all-round-good-bloke-hard-done-to, Steve Bruce. Quite frankly though, it’s highly unlikely that much of the footballing world even have known or cared that the fixture was taking place. It’s even more unlikely that they’d have any kind of opinion on which way they wanted the result to swing – unless of course they were promotion rivals (or Blues fans). The fact the media are still running with this storyline, re-hashing the past and casting a heavy bias over the situation means that it will never die down. The continuous narrative of the ‘big bully’ Aston Villa unduly sacking a great man and manager will keep doing its rounds and rearing its head whenever the two get remotely linked at any point in the future. It’s already a tired tale, but one that kept buzzing around this fixture irritatingly all the same. Of course, as Villa fans, we were all aware of this story, and the part that it was destined to play in this game. As confident as 5 wins on the spin had made us, and as much as we believe in this team and their ability to flatten anyone we face at the moment, the nerves were still there. Everyone knows when there’s a backstory written into a game that form goes out the window and anything can happen. Karma plays a part to ensure that justice is served and the win is granted to the most deserving candidates. So what was everybody expecting? A Wednesday win of course, for a happy, justified end to the Steve Bruce story – the mistreated manager getting one over on the club that gave him the sack. But what some failed to realise is that there was, in fact, an alternate narrative at play. The narrative of the goalkeeper who was sent out on loan to a League 1 side to make way for others deemed better than him. He made an essential penalty save to keep Villa in the game. The young winger not given the chance and shipped off to Portsmouth instead at the start of the season. He proved his worth with an almighty assist to grab the equaliser. The pushed out top-scorer of last season banished to the side-lines, deemed surplus to requirements and almost sold. Watch highlights of Villa’s goals and key talking points from the 3-1 win over Sheffield Wednesday here. http://gty.im/1140827532 It wasn’t the hard done to manager who got his sweet revenge on Aston Villa. 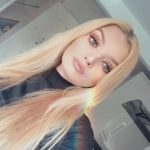 It was the hard done to Aston Villa players who got theirs, finally getting to prove themselves using the tactics instilled into them by the management team that Bruce’s departure made way for. That was the narrative that essentially won on the day. Justice was served, in the form of the truth making itself known once and for all – Letting Steve Bruce go was the correct decision. And Dean Smith is the shining light Villa have been crying out for for years. It was time to start fresh and bring in a forward-thinking manager who could imprint a brand of football into this club and its players in order to reach their utmost potential and return us back to the top flight where we belong. And it seems as though that’s what Sheffield Wednesday feel they’ve got as well. So there’s the happy ending, and on we’ll go with those three points that we fought hard for. 3 points that have brought our play-off aspirations ever closer. Spotlight: Why has the Aston Villa Youth Academy failed for so long? Spotlight: Jack Grealish – The Return Of The King & Villa’s Talisman.